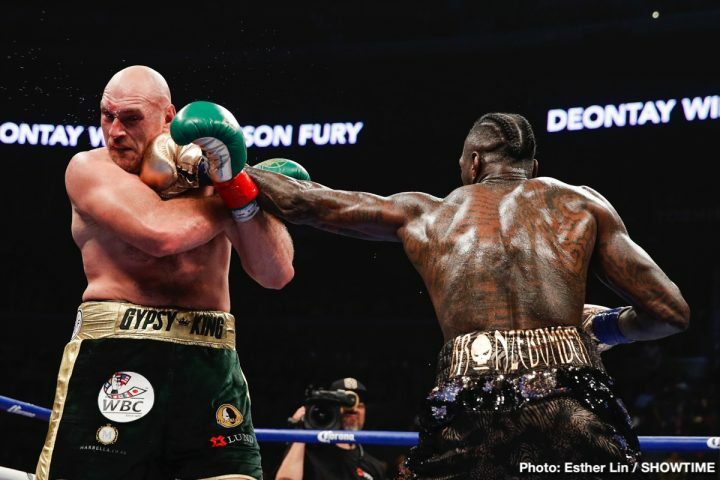 By Tim Royner: The rematch between WBC heavyweight champion Deontay Wilder and challenger Tyson Fury is close to being confirmed for May 18 at Madison Square Garden in New York. Tyson’s promoter Frank Warren in reportedly finalizing the deal with the unbeaten Wilder’s managers Shelly Finkel and Al Haymon to get the rematch done. The deal is expected to be finalized this week. There’s still no word about what the split will be of the revenue. Fury wanted a 50/50 split, but there’s a great deal of money that will be on the line for the fight, which will likely be televised on SHOWTIME pay-per-view in the United States like last time Tyson fought Wilder. The second fight is estimated to bring in £50m [$64 million], according to the Daily Mail. The management for both fighters asked the World Boxing Council to delay a purse bid so that they could have more time to hammer out a deal. A deal could be done by Wednesday of this week. If the deal isn’t done by that time, they could request another delay of the purse bid. Fury’s purse for the rematch with Wilder is said to be £20m [$25.76 million dollars]. That’s a nice tidy amount for the 30-year-old Fury to get in just his fourth fight back from a 2 1/2 year layoff from boxing. In his previous fight against Wilder, Fury made £7m [$9 million dollar] last December. Wilder and Fury fought to a controversial 12 round draw last December in Los Angeles, California. There are differing opinions on which of the two fighters deserved the victory in that fight. Some think Fury out-boxed Wilder in enough of the rounds to deserve the victory, while others point to the odd circumstances behind the 12th round knockdown in which Tyson looked to be unconscious and the referee decided to give a count to him instead of stopping it right away. Like last time they fought, Wilder will have his World Boxing Council heavyweight title on the line for his rematch with the 6’9″ Fury. The winner of the Wilder-Fury II fight will be in a good position to setup a unification contest against IBF/WBA/WBO champion Anthony Joshua (22-0, 21 KOs) for later this year. It doesn’t necessarily mean the fight will get made though. Joshua and his promoter Eddie Hearn have other ideas of what they believe Wilder and Fury deserve to get in a fight against them. The negotiations were slowed down due to Fury reportedly wanting neutral judges for the fight in order to avoid another controversial decision like in the first fight. They initially wanted the Wilder-Fury 2 fight to take place in Las Vegas. However, the Nevada Athletic commission were going to have their own judges work the fight rather than neutral ones. As such, the Wilder vs. Fury 2 rematch was moved to New York at MSG [Madison Square Garden] on May 18. It might not make a difference whether the fight takes place in New York or Las Vegas. If Fury gets knocked down by Wilder in the same way that he was in the 12th round, the fight will likely be stopped this time. The previous referee Jack Reiss won’t be working the rematch, so if Fury gets flattened in the same way, the fight will probably be stopped on the spot. Wilder vs. Fury 2 being staged at Madison Square Garden in New York would be the first of two heavyweight blockbusters for that city within a month of each other. Anthony Joshua is expected to defend his IBF/WBA/WBO titles against Jarrell ‘Big Baby’ Miller two weeks later on June 1 at the Barclays Center in Brooklyn, New York. Joshua, 29, had to settle for a fight against the 315 pound Matchroom promoted Miller after his promoter Eddie Hearn was unable to put a deal together with Wilder, Fury and Dillian Whyte for April 13 at Wembley Stadium in London, England. Hearn had booked the stadium well ahead of time, hoping to get one of these heavyweights to agree to a deal so that they could fill it to the brim on the April 13 date. To to Hearn’s surprise, the three failed to agree to the offers that he made to them. Hearn arguably spoiled it himself by not sweetening the offer after Wilder and Fury asked for a 50-50 deal. Hearn was insistent on them taking the smaller money. With superstars like those two, they’re not willing to take smaller money to fight a heavyweight that they feel is less talented them. Hearn failed to realize that, so he’s now stuck with Miller as Joshua’s opponent. After Joshua-Miller fight is done with, Hearn is going to have the same problems in trying to negotiate with the winner of the Wilder vs. Fury 2 fight to face AJ. They’re going to want a 50-50 deal, and if all Hearn is offering them is a 60-40 deal, he’s going to have to look elsewhere for an opponent to face Joshua. Whyte is the clear backup plan for Hearn if he can’t get Wilder or Fury to agree to a deal. If not him, then Hearn will likely go after someone like Kubrat Pulev or maybe even a rematch with Joseph Parker. Hearn only has so many options.